Alice Lowe has been touring the country with preview screenings of Prevenge, including Chapter Arts Cardiff on January 24th. Hailing from the Midlands and having starred in comedies such as Garth Marenghi’s Darkplace, Hot Fuzz and Sightseers, Alice Lowe is an artist whose work I have always followed. 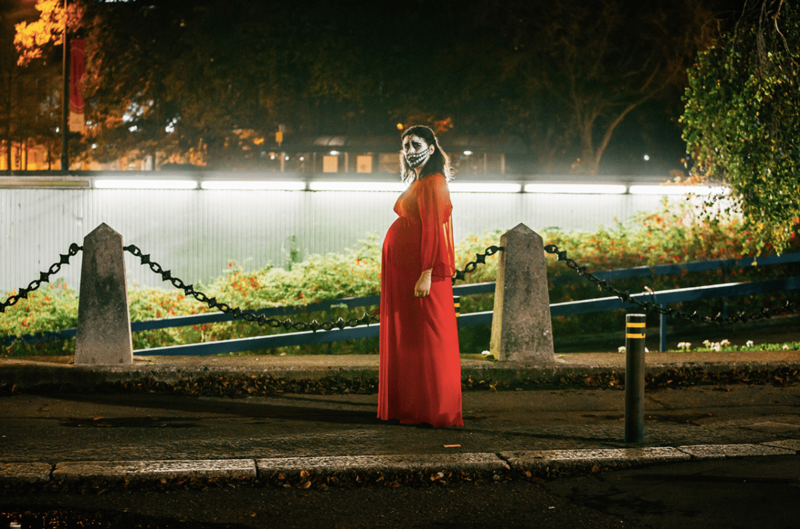 Prevenge is the first feature film Lowe has directed, filmed over eleven days in Cardiff, and it is fair to say you won’t have seen anything like it before. Ruth (Alice Lowe) is our protagonist. Her husband, and soon-to-be father of her baby, has been killed in a climbing ‘accident’. Prevenge begins under tragic circumstances with a bitter edge that becomes increasingly apparent, as Ruth and her unborn daughter crave vengeance. The setting is bleak, yet the cinematography is beautiful, and Lowe’s trademark sharp wit sends ripples of guilty laughter through the audience. Although this film will certainly satisfy fans of slasher horror, revenge movies and dark comedies, there is something else about Prevenge that makes it particularly unsettling. Yes, it is gory. Not your usual dimly lit hallways, full-moon horror, but a far more vulnerable, open-air, broad-daylight violence. Though relatively short for a feature film, an impressive amount of action is compressed within its 90-or-so minutes. And not only this, Lowe’s aptitude for character development still takes precedence. Ruth and baby’s victims are often given limited screen time, yet audiences are given a well-rounded picture of who each of these people are and what they represent. We get an idea of their attitudes and personality traits deemed to be negative, thus meaning that their killings have particular comedic impact. And the faces of Ruth’s victims are recognisable, including the likes of Mike Wozniak, Tom Meeten and Dan Skinner. The Q&A session after the screening proved valuable in aiding the audience’s understanding of the key issues of the film and artistic decisions in production. Alice herself is very astute in her creative thinking, as well as being relentlessly humble. She explains how she came up with the idea for Prevenge whilst six months pregnant, wrote the script in a matter of days and then, within a couple of months, they were filming. An interesting discussion point that Alice raises following this regards Ruth’s antenatal nurse (played by This Is England and David Brent: Life on the Road‘s Jo Hartley), in that she is the only genuinely constant kind person who has Ruth’s interests at heart. Lowe makes it abundantly clear that worrying about whether audiences will like Ruth was never an item on her agenda, and it is empowering to hear her say this. The interesting thing, however, is that we do like Ruth, despite her sarcasm, callousness and brutality. We can each see an element of our own psyche within Ruth. Hearing Lowe’s perspective on various aspects of Prevenge‘s writing and production gives viewers much to think about. Audiences are left wondering who, or what, is the true source of our discomfort; is it Ruth’s actions or the fact they almost seem justified? Is Ruth alone or is she stifled? Is this baby an embodiment of innocence, or evil? This film is an artistic triumph: an independent production that is definitely worth supporting. Prevenge will be returning to Chapter Arts Cardiff, as well as other cinemas across the UK, later this month. Follow Alice Lowe and Prevenge on Twitter to keep up to date.